Good morning! I hope you all have had a wonderful weekend and start to your week. 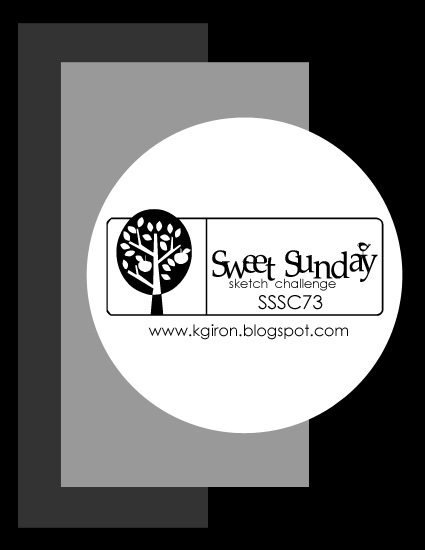 I'm back with another fun and fabulous Sketch Tuesday from Skipping Stones Design and this week the team is working with Sweet Sunday Sketch #73. For my card today I'm using Always Here along with the new set Grunge. I started by making my own patterned paper by stamping the background stamp from Grunge over the vanilla cardstock circle. 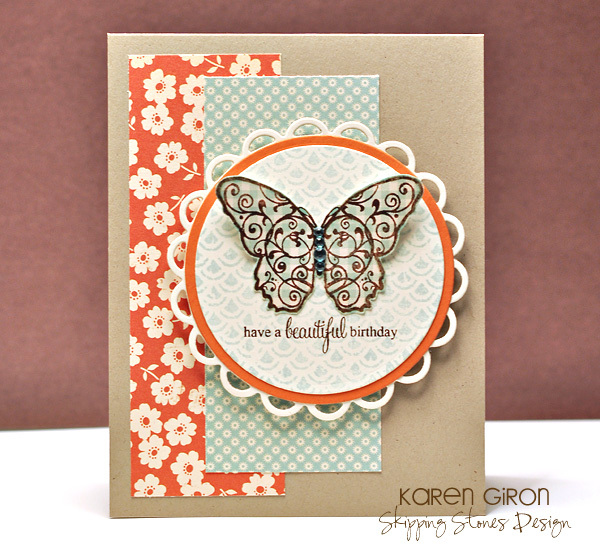 I stamped the sentiment from Always Here right over the top of it and added a paper pieced butterfly. You can see what the rest of the team has created over at Skipping Stones Design and I do hope you'll join us in this week's Sketch Tuesday! Just an all around Fabulous card, Karen! I'm in love with the patterned papers you used and how you tied the stamping in so well. Thanks for a super sketch and I love your choice of color!! Great card Karen! I love the blue/orange combo. It's stunning! Love your take on the sketch-hard to believe that background on the circle came from Grunge! It's so sweet and feminine in that pale blue! And your butterfly is gorgeous! Karen...I love this sketch - and your card is just gorgeous!! You are so creative!! I would love to see a video of you explaining how you pick your papers for a sketch!!! I Love It ! Gorgeous card Karen...absolutely love it! This is so gorgeous Karen! I love the softness and the colors you used!